Supercell’s collectable card and tower defence hybrid Clash Royale hit daily revenue of $1.5 million for the month of August. According to Sensor Tower, the most profitable day of the month was August 7th, which saw $4 million made through in-app purchases. That figure was the largest daily intake Clash Royale has seen since April. The average August haul was also up slightly from the $1.2 million made per day on average in July. 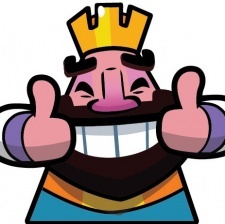 Clash Royale hit the $2 billion revenue mark back in July of this year and took just two years to do so, having launched March 2016. Hitting the milestone also meant that Finland developer Supercell became the first mobile publisher to have more than one multi-billion-dollar game on both the App Store and Google Play. It’s other billion dollar plus game is strategy title Clash of Clans, which has grossed in excess of $6 billion since its launch back in 2012. Supercell will be attending this year's Pocket Gamer Connects Helsinki, you can get your own tickets here.